Optimizing performance of TempDB is critical to the overall performance improvement of VLDBs. Today, we’ll cover a couple of Trace Flags that add to TempDB’s performance improvement. Each database has a filegroup; Each filegroup could have more than 1 files. Similarly, TempDB also could have multiple data files (for VLDBs). This Trance Flag 1117, enables Sql Server to grow all the files in the filegroup at the same time, when one file needs to be grown. As you can imagine, this option has some pros and cons. It is generally a good idea to grow all the files in a filegroup at the same time. Since this flag impacts TempDB, which is utilized by all user databases, this could be an unwelcome option for some environments. So a better compromise might be to pre-configure TempDB data files to the maximum size needed for your environment, so as to not encounter “file increment” events. When space is allocated to a database file, internally Sql Server adds in increments of 64k size extents (group of 8 pages, which are 8k each; 8*8k=64k). This Trace Flag enables Sql Server to allocate Uniform Extents during this size increments (and avoid allocating mixed extents). It impacts all new object creations in all the databases. This is important for Sql Server TempDB as it is utilized by all user databases at the same time. There is a possibility that it could result in reduction in efficiency of space utilization, but that is a small price to pay for better performance. Ran into an interesting version of the familiar error message. When installing Sql Server 2012 on a Windows Server 2012 R2, this error appeared. Please note that, during pre-install checks, it just highlighted lack of .Net 3.5 it as a warning, but not as a failure. When installation is attempted, it fails asking for .Net 3.5. From Task Bar, open Server Manager. Go to Manage, Add Roles and Features. In the Add Roles and Features Wizard, click through the initial screen; When you are in ‘Installation Type’ tab, choose ‘Role-based or Feature-based installation’. Under Server Selection tab, choose the appropriate server name. If you are running it on the server, its name will be displayed in the Server Pool section. Skip the next section (Server Roles). Installation of .Net 3.5 is under Features. In the Features section, click the check box to install .Net 3.5. Components necessary to install .Net 3.5 are usually not readily available, so having access to Windows Server 2012 DVD or ISO would be necessary. In the Confirm Installation Selections step, at the bottom of the screen, click on Specify an alternate source path link to specify the path to Windows Server 2012 ISO. Once necessary binaries are identified, installation will progress to completion. Then reattempt, Sql Server installation. Sql Server: What Sql Components are Installed? Not often, but once in a while, we need to check what Sql Components are installed on a given virtual machine; so we could replicate (install the same components) on any dependent database virtual machines. Very rarely do we get opportunities to appreciate the multiple features made available through the Sql Installer. Microsoft provides awesome tools to achieve this fashionably. Under Sql Server Installation Center, open Tools. Go to Installed Sql Server Features Discovery Report. 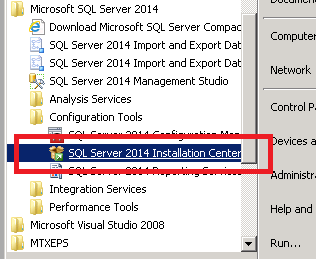 When you click on it, Sql Server Installation Center will generate the report. Invalid value given for parameter PASSWORD. Specify a valid parameter value. The migration script was syntactically correct, but it still kept throwing this error. On further investigation and with some help from MSDN, the underlying issue became less cryptic. The problem is not with the databases, but the migration script. In particular the step where we migrate logins. This was an old script from the DBA’s library; The team continued to use the same script for several years. Now that we are going to newer versions of Sql Server the password hashed length is causing problems. In newer versions, the password hash has higher requirements. Step 1: We re-created the same login that has a blank password as shown below. Step 2: On login attempt, the user was able to change the password.